I can't believe that my summer vacation is halfway through!! It's been really nice to be off of work but to tell the truth, I feel busier than ever!! I still feel like I don't have enough time in the day. I've been having class for the past two weeks (I take PD courses to try to get a tiny increase in pay). Other than that I've been try to stay busy and be productive. Linking up with Doodle Bugs Teaching to show you a peek at what I've been up to over the past week! 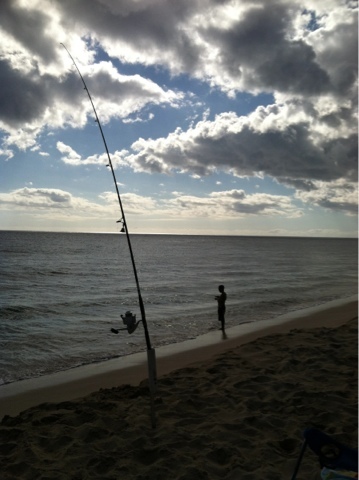 The boy and I headed out to the North Shore this week to hit up some fishing spots. Of course, we had to stop by the famous shrimp trucks!! 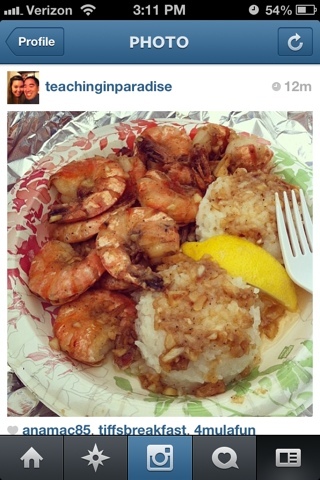 This is the garlic shrimp plate I had for lunch the other day. It was SO GOOD, I practically scarfed that entire plate down!! Like I said earlier, we've been trying to find some time to make it to the beach since I am so casper white, lol. Sadly, during the school year I never find time to make it out much and turn very very pale. We've going to the beach and fishing lately...Here's my set up. I just reel the line in if the little bell rings, which of course means that I hooked a fish. The boy likes walking around and casting his line out...so that's him with his pole in the background (even though you can't even see a pole). I've also been working on updating my plan book for this upcoming school year. 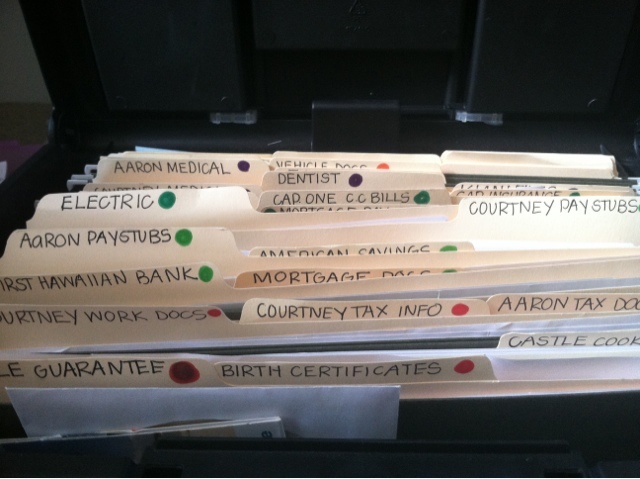 I currently have one listed on TPT that I used last year but I wanted to add some things in it. This one I'm working on has a lot of color, to match my theme this year (bright colors). I'm debating if I should add this to my old plan book file (which is mostly black and white) or upload this as an entirely different product. And last but not least, I've been using my time wisely at the beach. While my pole is waiting for bites, I'm working on reading this book by Stephanie Harvey. Reading has never been my area of strength to teach. The past few summers I've been working on reading lots of pd books to hopefully strengthen my craft. 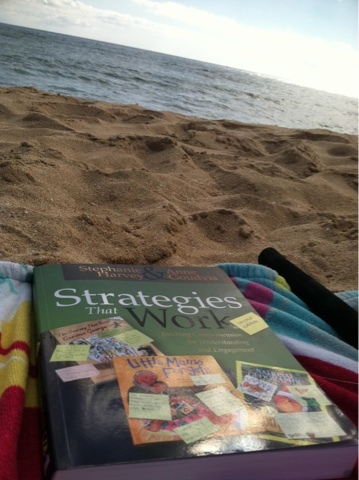 I'm looking forward to implementing all of the awesome strategies I've been reading about. I'm currently working on creating a Grade 2 Math Pre Assessment. 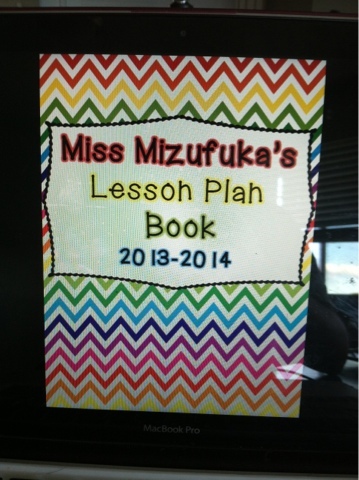 I have one up in my TPT store for Grade 3, which contains all of the 2nd grade CCSS. I use this in my classroom to find out where my students are at when they come in to me. I'm looking for somebody to look through this file for me..someone familiar with grade 1 standards (or someone in 2nd grade that knows what students should come up knowing), editing, format, vocabulary being used... I haven't worked with kids that young in awhile so I'll need to make sure that I'm using proper vocabulary. This was a TPT request I had. If anyone is interested in reviewing this file for me, leave me a message in the comment section with your email. I'll email the file to you for free! I'm looking for 2-3 people to view this for me. PS: It seems that everyone is making a switch over to bloglovin. I'm not too sure if I will lose all my followers if I don't make the switch...BUT just in case, make sure to follow me on Bloglovin...please. As soon as I get there we ARE going to that shrimp truck!!! yes!! Your new school is actually pretty close!! I think I saw it on the way home :D My fiance was telling me which way to tell you to drive to get to work! haha.